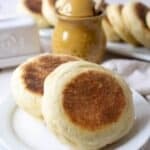 Homemade sourdough English muffins take a little bit of time to make, but are worth every minute! I made English muffins before, but this time I wanted to mix it up a bit and used sourdough. 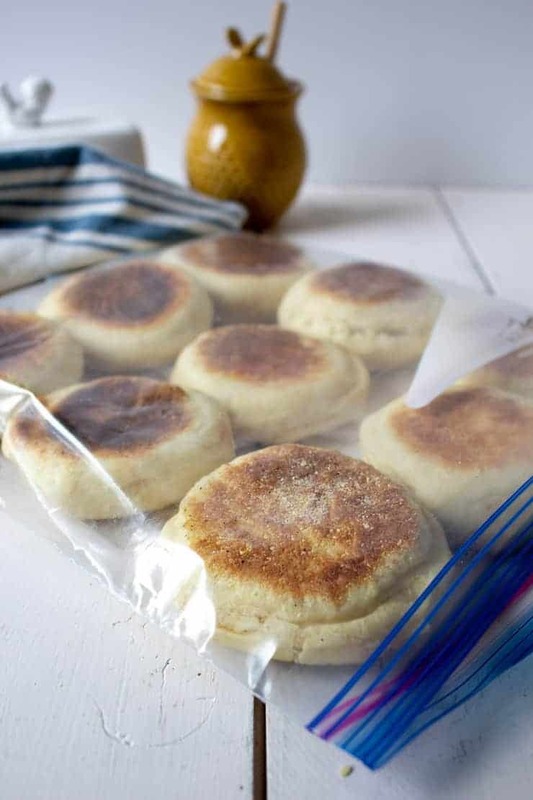 To make these English muffins, you need to first start by making a sourdough starter. If you already have a starter on hand, use that. Otherwise plan at least one extra day for the sourdough starter. If you can make the starter 2-3 days ahead of time, your starter will have more flavor. 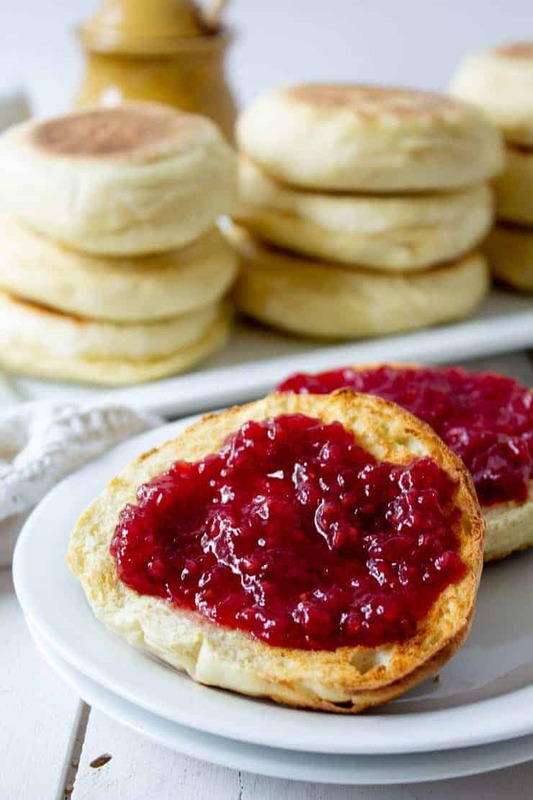 English muffins are made with a yeast dough, but unlike most breads made with yeast, these are not baked. They are pan fried. You make the dough just like a traditional bread dough. You let the dough rise, punch it down and form into the muffins and let rise again. After the second rise, they are cooked on an ungreased hot skillet. I like to use a cast iron skillet. Cook for 3 minutes on each side and then flip. I do this twice per English muffin so teach takes about 12 minutes to cook. It takes a bit of time to get the pan just right. I cook these over a medium low heat. If the pan feels too hot, just lower the temperature. After your muffins are cooked, allow muffins to fully cool. Then your muffins are ready to eat. Split your muffins in half and pop in the toaster for a nicely toasted treat. To split your muffins, use a fork. Just poke the tines of the fork through the middle of the muffins. Continue all the way around the muffin and then pry open with fork. 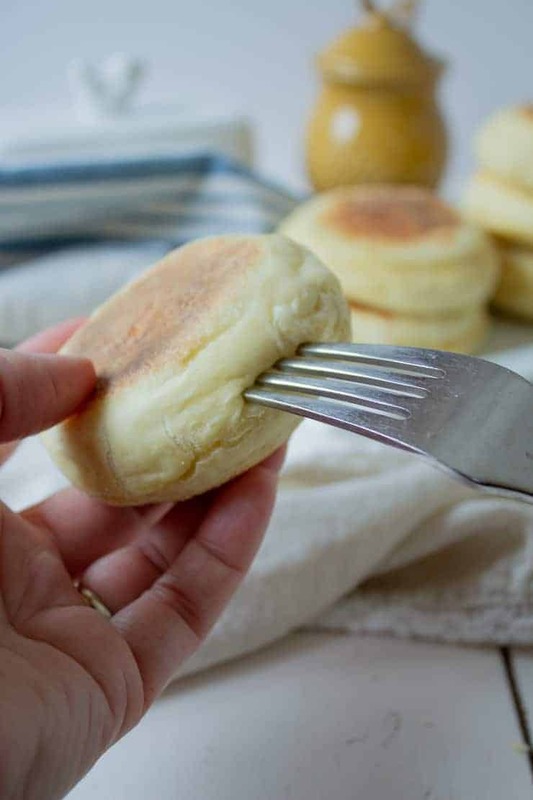 Why Fork Split English Muffins? 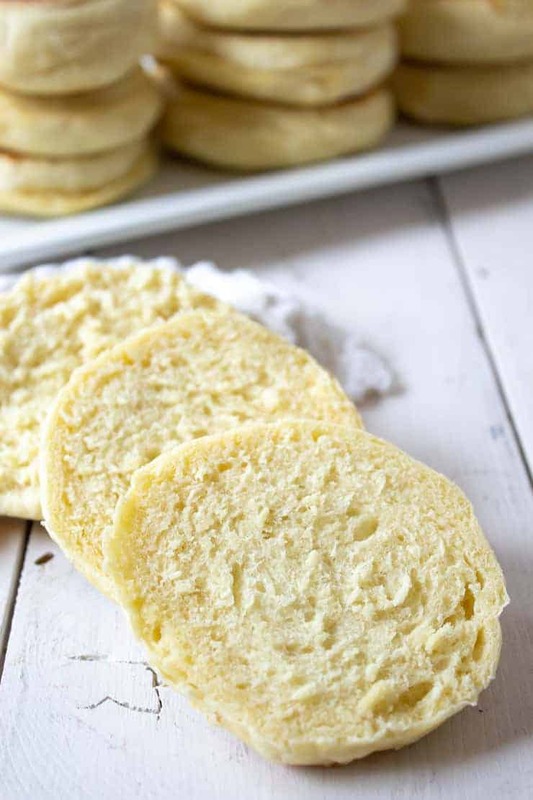 This recipe makes 24 English Muffins. These only stay fresh tasting for a few days so I usually freeze at least half the batch. These muffins are perfect for making Breakfast Sandwiches with a scrambled egg and breakfast sausage. 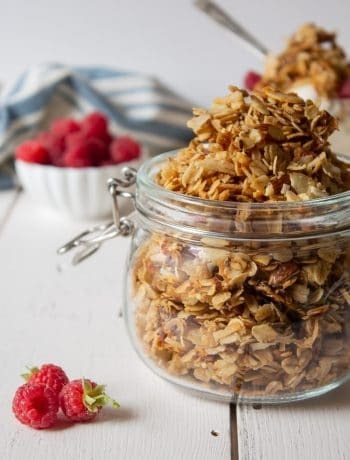 They are also perfect with a bit of homemade strawberry jam! Coming milk yeast and sugar together in a mixing bowl. Let sit for 5 minutes until bubbly. Add sourdough, butter, eggs, salt and 2 cups of flour. 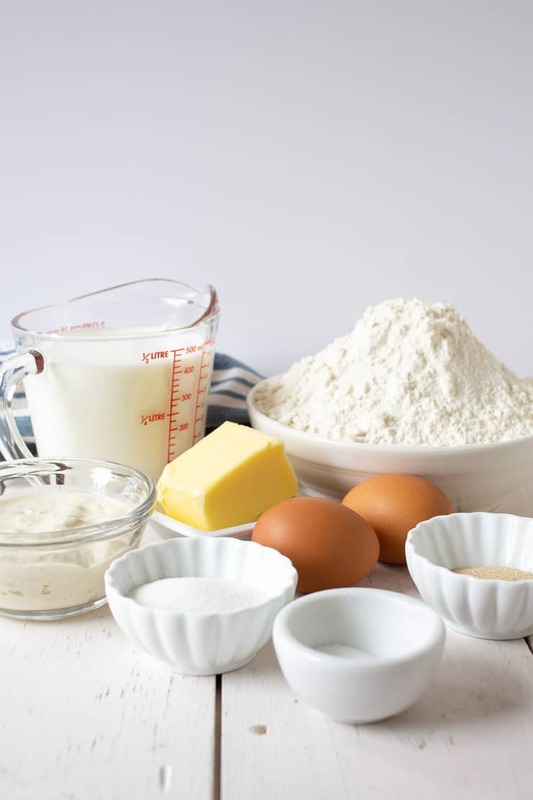 Continue adding flour 1/2 cup at a time until dough comes together and forms a ball. You may not use all the flour. Put dough in a greased bowl and cover with plastic wrap. Set aside until doubled in size, approximately 1 hour. When dough has doubled, gently punch down and form into another ball. Divide dough in half and then in half again. Divide each quarter into 6 equal pieces. Form each piece into a ball. Gently flatten dough so it forms a 4 inch disc. 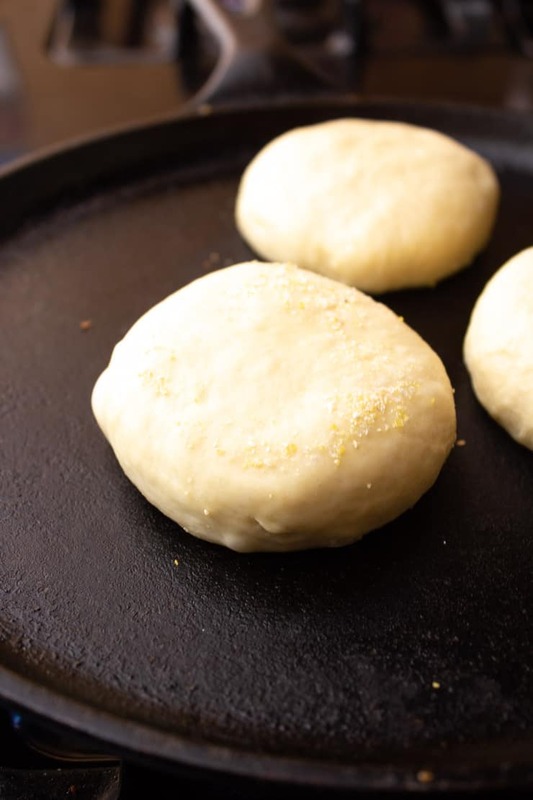 Place dough on a surface covered with corn meal to help avoid sticking to surface. Just before cooking, flatten again so muffin has a flat surface. Preheat a cast iron skillet or other skillet over medium low heat. Place muffins on hot surface so muffins are not touching. Cook for 3 minutes per side and flip. Cook again for 3 minutes and flip again. Repeat one more time. Total cooking time is 24 minutes per muffin. If muffins burn before 3 minutes, lower heat. Cool muffins on a baking rack until fully cooled. 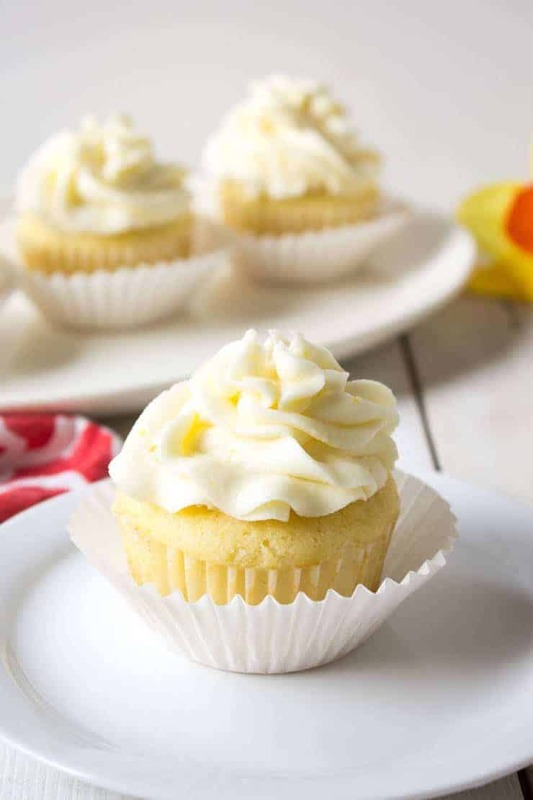 Slice muffins in half with a fork. 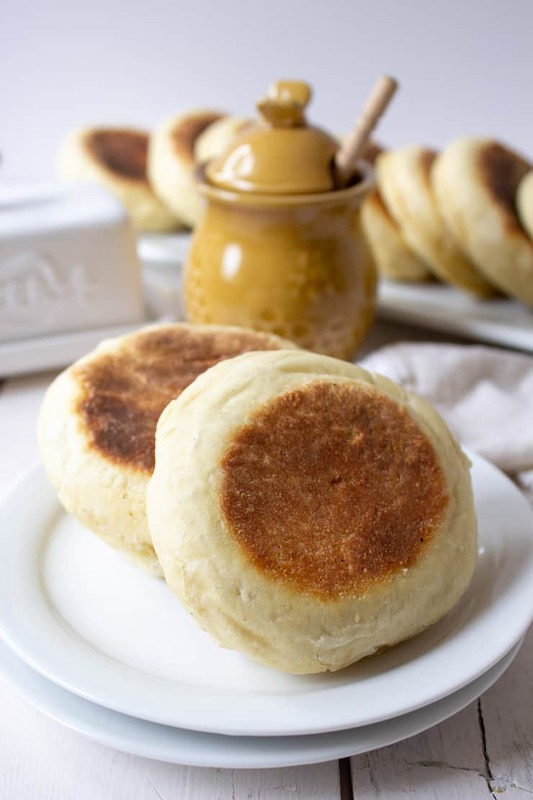 I adore English muffins, but I have never made them with sourdough, I should definitely try it! They look absolutely wonderful. I still have yet to try my hand at English muffins Kathy! These look delicious. Pinning and on my baking list! Oh wow, Kathy! These look so perfectly delicious! I’ve never seen a recipe for English muffins before. I didn’t realize they were cooked on a skillet. I make my kids a sausage and egg (Mc) muffin for breakfast. Sometimes I use sourdough, sometimes I use English muffins. 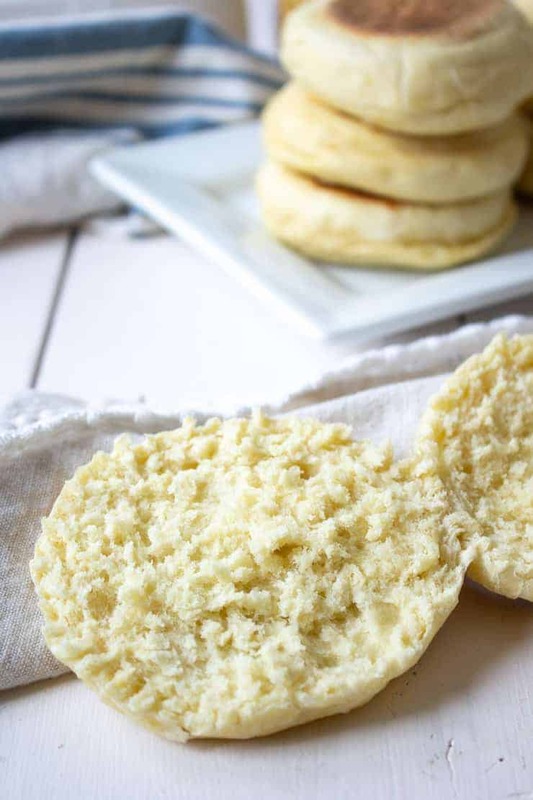 Your sourdough English muffins are the best of both! Definitely have to try them! They are pretty fun to make and oh so delicious to eat! I love English muffins! In fact, I eat a scrambled egg on an English muffin almost every day for lunch. It’s an easy one to make, and I love having hot food for lunch. 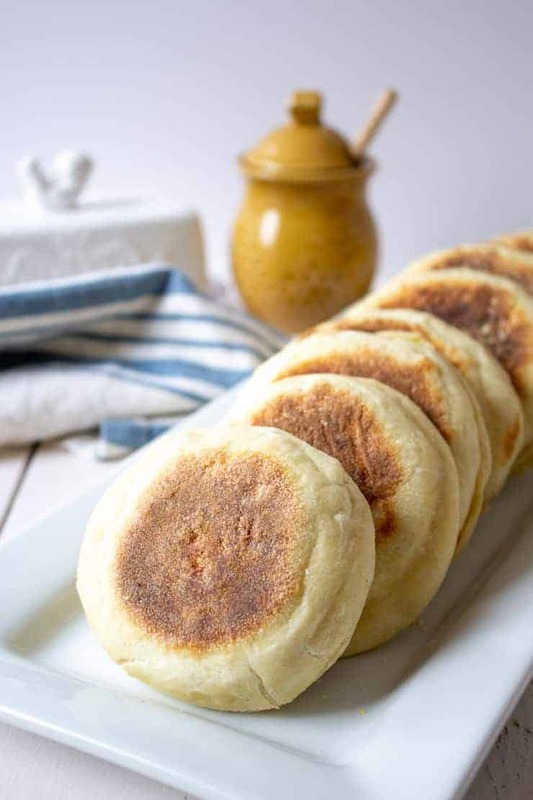 I haven’t made my own English muffins in years, and now I’m wanting to go back and do that! But this post reminds me that my sourdough starter bit the dust. I need to start a new one. I love the flavor of sourdough. Thanks so much for sharing this post, Kathy! I get on a sourdough faze every once in a while and do a great job of keeping my starter going. But then I find it gets away from me and I have to start it all over again!